The age of ApocaLEGO is upon us. As Andrew said, ApocaLEGO is the new Steampunk (I’m working on a diorama myself – my first large LEGO creation in over a year). 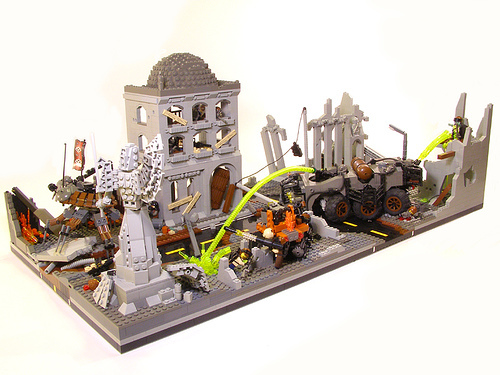 Fantastic new creations are popping up, including this beautiful diorama by Legohaulic. diorama must have to had to be countet as a ApocaLego Diorama or can I just build a dioram with Darth Vader And Luke Skywalker and just call it a ApocaLego Diorama?????!!!!!!!!!!!!! Wha? How do you get Star Wars out of Post-Epoc? There are usualy damaged buildings, rag tag vehicals, and wastelands of other sorts. Anyway, I was thinking of making an ApocaLego (love that) diorama in sort of a mountian/snow scene, but I don’t know. You Ty, I mean if I make a ApocaLego diorama can I trought in some Star Wars Minifigs in it or will that make it a Star Wars Diorama??? ?